Pulse attack: Why no gun control after mass shootings. 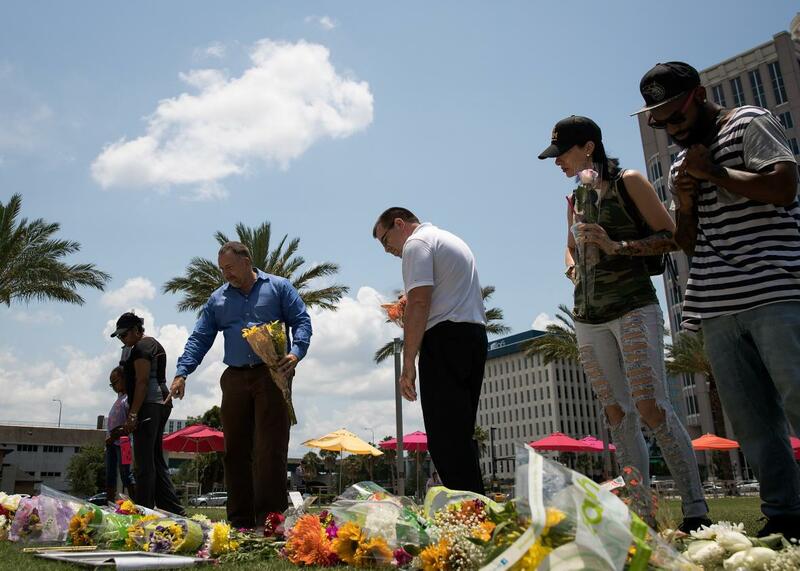 People visit a makeshift memorial at the Dr. Phillips Center for the Performing Arts on Monday in Orlando, Florida. As Americans have become more and more accustomed to the routine nature of mass shootings in this country, the media, including Slate, have fallen into a standard set of responses to these incidents. First, there are outraged pleas that something be done to prevent the next horrific shooting. These are soon accompanied by reported explanations or despairing editorials describing the structural factors preventing that from happening. This pattern has been going on at least since the 1999 shooting at Columbine High School. There are waves when the pleas are more hopeful and the pessimism less apparent—there was a heightened sense that something could get done after 20 children and six adults were slain at Sandy Hook Elementary School in Newtown, Connecticut, for example. But in the wake of the failed legislative attempts after that massacre of mostly schoolchildren, the tone of the pleas have become more like collective despair. There is no optimism anymore. Below is a list of responses to some of the most prominent American mass shootings from Columbine through Sunday’s attack on a gay nightclub in Orlando in which 49 people were killed. They reveal both the aforementioned pattern of coverage and also serve as an extremely sad, seemingly hopeless timeline. All that [talk of mental health] is common wisdom. What is not is the need to banish America’s guns from everyday use. To non-Americans, oblivious to the constitutional guarantee of the right of the people to keep and bear arms, the connection between guns and tragedy seems obvious. Among the further futile gestures housed in a second piece of crime legislation that failed [after Columbine] was a measure to reduce the Senate’s proposed waiting time for purchases at gun shows and to limit the number of gun shows subject to any waiting period whatsoever. All this despite polls showing two-to-one support for stricter gun control even before Columbine. There is no reason that any private citizen in a democracy should own a handgun. At some point, that simple truth will register. Until it does, phones will ring for dead children, and parents will be told not to ask why. [Since the 2000 election], Democrats have grown very reluctant to talk about gun control. It has become a radioactive issue. And a Republican who once was an ardent supporter of it, Rudy Giuliani, now says he supports the right of individuals to bear arms and that the states not the federal government should decide how to control guns. After [Al] Gore’s defeat, Terry McAuliffe, then chairman of the Democratic Party, was vocal in advising Democrats to abandon gun control as an issue in future elections. Until Congress shows the political courage to [act on gun data], there will be more catastrophic breaches of national security and more tragic loss of life. If lawmakers fail to close gaps in the background check system and reform the Tiahrt amendments, the next terrorist shooting on American soil will be shocking, but it will not be surprising. No prosperous country not riven by civil conflict has anything like our volume of mass killings. And yet for all of the fascination with mass murder in the media, in Hollywood—and among us—no politician will do more than pay lip service in condemning it. No journalist will crusade against it. No celebrity will take it up as a cause. Nobody does a damn thing to try to stop it. Excuse me, but gun-safety advocates don’t “need” to accept that most gun owners are responsible. We always have, as the president sort of acknowledges later in his piece. How can repeating NRA propaganda against advocates of sane gun laws be helpful to this debate? But given that in Arizona, a deranged maniac was able to spray enough bullets into a crowd to kill six and injure more than a dozen, it’s remarkable that a ban on one of the principal devices that made such a feat possible won’t even be part of the discussions. Since 9/11, 33 Americans have been killed by “terrorists”; roughly 150,000 Americans have been killed by non-terrorists: that is, your run-of-the-mill murderers. Murder, like the leading cause of death—heart disease—is often preventable, through regulations, education and medical intervention. As long as nobody stands up on the other side to call for clear and immediate restrictions on gun purchases, the pro-gun lobby is likely to slide through the crisis without any serious threat to its pet issues. On gun violence and how to end it, the facts are all in, the evidence is clear, the truth there for all who care to know it—indeed, a global consensus is in place, which, in disbelief and now in disgust, the planet waits for us to join. We underestimate the fascination guns hold for young people. We fail to appreciate how they can become the catalyst for a chilling metamorphosis. I’d humbly suggest that now—while the blood is still fresh on the ground and the horror still with us—is exactly the right time to point out the insanity of American gun culture and the reflexively obnoxious move by the NRA and its supporters to stifle not just rational gun control legislation but debate. Even if there were time, the leadership in the Republican-controlled House has resisted gun safety bills. And the Democrats who run the Senate see no reason to revisit the issue. It is not an act of fate that has caused 150,000 Americans to die over the past 14 years. It is a product of laws, court decisions, lobbying and pandering politicians. We can change it. The America that believes that guns make the country more dangerous—urban, educated, Democratic America—is proposing to disarm the America that is sure (indeed increasingly sure) that safety lies in keeping firearms close by. As a result, nobody is about to disarm anyone. [L]et’s assume that … the combined influence of these policies could prevent only 10 percent of our nation’s more than 33,000 annual gun deaths. That would still be the equivalent of preventing the 9/11 terrorist attacks, every single year. We don’t need gun confiscation to save lives. We can do that through common-sense gun reform. [A] Congress that has been deeply at odds with Obama on health care, immigration, fiscal policy and other major issues has been especially in­trac­table on gun policy, and there is little expectation that lawmakers will take any action to modestly expand federal background checks, let alone enact broader firearms restrictions. It cannot go on. And at this moment, I can’t bring myself to complete the thought by saying, but it will. This is an abomination, and it is a political choice. Bearing witness to traumatic events is hard, and the costs of caring are huge. But the alternative is worse. Although it is horrifying for us to see images and hear stories from the tragedy in San Bernardino, it is equally awful that the country seems to feel numb to it, knowing that it could happen again. It makes no more sense to blame Islam for the Orlando shooting than it would to blame mental illness for the Sandy Hook massacre. The common thread and decisive factor in those and so many other mass shootings was the availability of powerful semiautomatic weapons that serve no purpose but to kill. It’s not likely the nation will ever be free of malcontents, whether they’re homophobic religious zealots or unstable nuts. But it could be free from the guns that enable them to do so much harm, so easily. What do I write when America has once again been turned into a shooting gallery—this time in a hate-filled attack on the gay and lesbian community—setting still another record for the worst mass shooting in American history? In fact, the deadliest attack here since 9/11. The kind of wholesale slaughter of innocents that I and others have predicted time and again? Despair: “Gun Laws and Terrorism: An American Nightmare,” by John Cassidy, the New Yorker, June 13, 2016. “Sandy Hook marked the end of the US gun control debate,” Dan Hodges, a British journalist, tweeted in June of last year. “Once America decided killing children was bearable, it was over.” If Hodges was right and the United States will never take action on gun control, then it is heading toward a future where much of the country is a fortified camp, with stricter rules governing who is allowed in, heavily armed police permanently patrolling urban hubs, more public buildings adopting airport-style security, and many more millions of guns sold, as alarmed citizens seek to protect themselves and their families against a perceived threat. *Correction, Dec. 3, 2015: This post originally misstated the date of the Charleston attack as June 18, 2015. This article has been updated since the attack in Orlando.